It’s never too early to baby proof your home, even if your infant hasn’t cracked her first smile yet. After all, your baby will be mobile before you know it, and your home is her first playground – new discoveries are endless. And, yes, your baby eventually can and will get into (or out of) anything within her reach. Babies can get into plenty of trouble long before they’re crawling or walking. As early as 5 months old, babies start to roll over. And depending on their personality, they can quickly master rolling themselves over to the other side of a room and grasping things they shouldn’t. That’s why it’s crucial you start baby proofing your home before it’s too late. Many baby and toddler injuries can easily be prevented if you know where the trouble spots are in your home. Follow our tips, baby proofing checklists, and best baby proofing product recommendations below to make your home as safe as possible for your little loved one. What Are The Best House-Wide Baby Proofing Tips? We’ll start by giving you a rundown of baby proofing house essentials – areas you need to check for potential hazards in every room and common area of your house. Use outlet plugs or covers in every outlet plate your baby could reach to prevent electric shock or electrocution. There are cheap plastic plugs you just plug in and out each outlet, but your little one could quickly figure out how to pull them out (and you have to remember to plug them back in after using the outlet). A better alternative is outlet plates that stay in place but swivel to accommodate a cord plug. For outlets that are almost always in use, you can purchase an outlet cover that prevents your baby from unplugging cords and at the same time shortens the cord so your child won’t get tangled up or trip on the cord. And we recommend using a power strip cover if your baby can access your power strips. Use door knob covers or locks on all necessary doors to keep your toddlers from getting into rooms with hazards, such as the basement, attic or closet doors or the door to your garage – pretty much anywhere that’s not baby proofed. Door knob covers are a must for all exterior doors. Once toddlers are tall enough to reach a door knob, they can be out of your house quicker than you think. The same goes for sliding windows. Add a layer of security with easy-to-install window guards, leaving room for the window to open no more than 4 inches. Window blind cords can pose a very real danger of strangulation — babies can wrap them around their neck and get tangled up in them. Either tie up blind cords out of baby’s reach or a safer option is to use blind cord wraps. Secure your kitchen and bathroom cabinets and drawers, where babies can gain access to toxic cleaning and beauty products or sharp objects. Some latches work better than others, depending on your child’s level of development and curiosity. Unless you’re prepared to switch up to the next level of baby proofing (some curious toddlers can figure out simple latches pretty easily), we recommend going with magnetic locks that keep out the best puzzle solvers. Better yet, put all potentially hazardous products in a high cabinet, where there’s no way your toddler can gain access. Not long after they begin crawling, babies will pull themselves up on anything to get upright, and your furniture is inevitably an easy crutch. There are two major hazards involved with furniture – injuries from falling on sharp edges and corners and those from furniture tipping over onto your baby. It’s virtually impossible to keep your burgeoning toddler from exploring new heights, but fortunately, there are a lot of baby proofing products to safeguard against injury, including pad protectors and furniture anchors. Here are some of our recommendations. Your kitchen and bathrooms leave room for a lot of potential injuries, from poisoning and drowning to burns and sharp object injuries. Where do you start? Install cabinet and drawer locks where you store any chemicals, beauty products, and small or sharp items. Prevent scalding or burning from your faucets by setting your water heater temperature to 120 degrees Fahrenheit. And in your kitchen, baby proof your stove and oven with an oven door latch, oven knob covers, and, for extreme safety from little hands reaching your stove top burners, a stovetop safety guard. When cooking, make sure you turn pot and pan handles away from the front and any open sides of your stove. In your bathrooms, baby proof your toilet and bathtub. Install toilet seat locks, move all shampoo and other toiletries away from baby’s reach while in the tub, get a tub spout cover to prevent injuries from head bumps, and add a non-slip tub mat in your bathtub. Move your toilet paper out of reach. The best prevention? NEVER leave your baby or toddler unattended in the bathroom. Safety gates are an absolute must if you have any easily accessible stairways or a working fireplace in your home. Place gates at the top and bottom of your stairs – babies will roll, crawl, or toddle their way up and down. Yes, they can be a pain for parents and older children to navigate, so try to find gates that are easy to latch and unlatch, ideally with one hand. This will save you a lot of headaches when trying to carry things up or down your stairs. Which Safety Gate is Right for Your Home? Watch this video for tips to help you decipher which gates will work best in different areas of your home, or read up on baby gates in our review of the best baby gates. Yes, there are a lot of baby proofing house essentials, and it can get overwhelming when you get ready to purchase everything you need. So, here’s a simple checklist to help you make sure you’ve covered all of your bases. 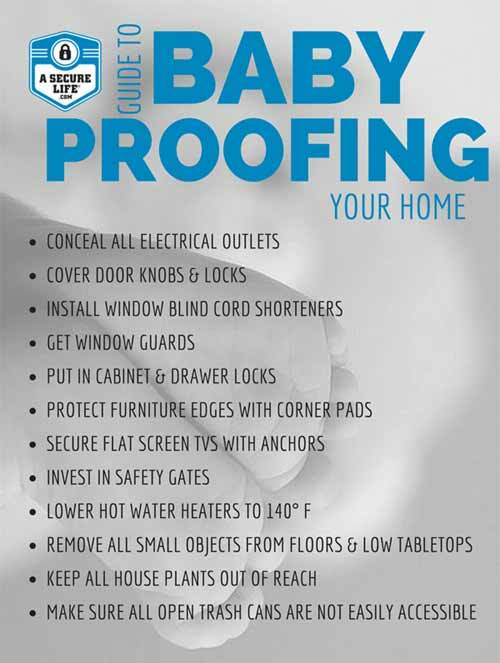 Your baby’s safety is priceless and baby proofing your home is relatively affordable and easy. Not to scare you but according to the Centers for Disease Control and Prevention (CDC), injuries are the leading cause of death in children ages 19 and younger. But, there’s good news – the vast majority of these are preventable. Leave no outlet uncovered or cabinet unlocked. With relatively inexpensive baby proofing products and the ease of DIY installation, there’s little reason not to make your home as safe as possible. What are your tips and tricks to baby proofing a house?